Twelve men celebrated their seminary graduation on December 20, 2012. That may not seem remarkable, but these men are inmates at the Danville Correctional Center in Illinois. 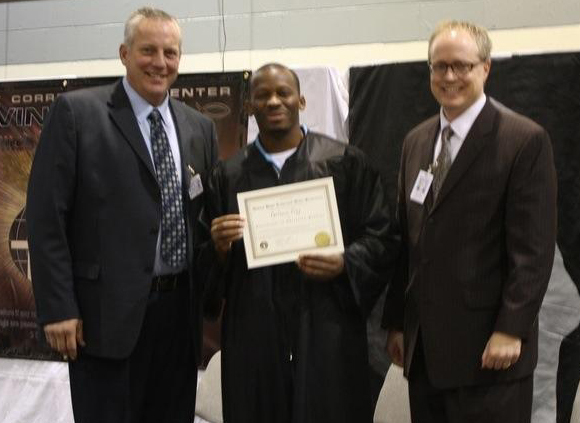 They received certificates for completing 30 credit hours in a year of study at Divine Hope Reformed Bible Seminary, which meets on-site at the Danville facility. The meal was the first time Rev. Brummel had the opportunity to eat with his theological students. Even though they are served the same food, he usually must eat in a different location. Not only was it unusual for him to dine with his students, but it also provided the rare sight of a warden eating with inmates. Thirty friends of the Seminary joined the faculty, Board, students, and the wardens to celebrate this milestone. Professor Mark Vander Hart, from Mid-America Reformed Seminary, delivered the commencement address. Rev. Vander Hart was involved in the organization of Divine Hope Seminary and still serves as an ex-officio member of the Board. The spring semester has begun for Divine Hope Reformed Bible Seminary with 32 students filling the classroom. One of those students transferred from another institution in order to attend the Seminary. “We praise God for providing us with our first transfer student! So far transfers from maximum and medium security institutions have been denied,” explains Rev. Brummel. “But God opened the door for Kevin to transfer from another medium security institution to join us for our spring semester.” Rev. Brummel currently has 15 applications from men in other facilities requesting transfers to Danville to pursue a theological education. Divine Hope classes meet three days per week. Rev. Brummel leads devotions and teaches Greek, Anthropology, and Ancient Church History. Two days per week, he is joined by John Surowiec, who provides instruction on the epistle of Romans to the entire class and on the Heidelberg Catechism to the new students. On those days, Rev. Brummel teaches Old Testament History: Monarchy Period in addition to his instruction on Greek and either Anthropology or Ancient Church History. The conference theme is “The Glory and Supremacy of the Holy Trinity” and will include these sessions: God in Three Persons: Blessed Trinity, Creatio ex Nihilo: Your Father Created the Cosmos in Six Days, and Not a Hair Can Fall from Your Head: The Supremacy of God in Providence. The above article by Glenda Mathes appeared on pages 16-17 of the February 27, 2013, issue of Christian Renewal.